Nearly 20 years ago, members of a UW student, faculty and staff organization called Voyagers noticed something missing. 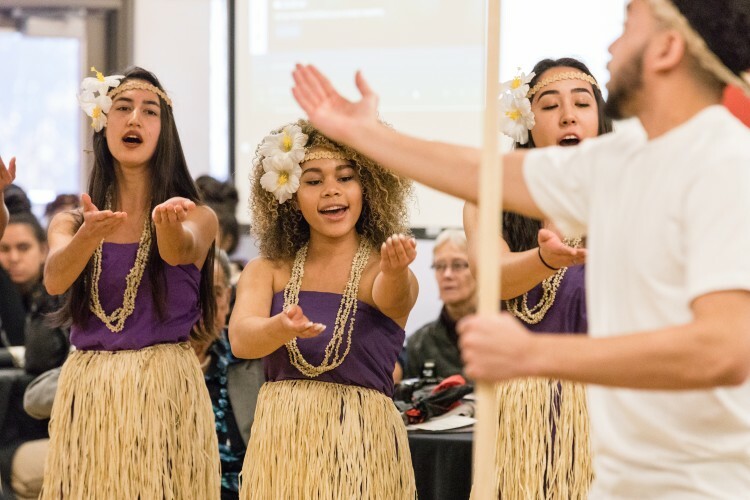 The group, for Pacific Islander students and their allies, found little of their heritage or culture reflected in courses and activities, and scant evidence of efforts to grow their numbers of students and faculty. They mobilized for recognition, and over time, as other groups were involved, there were achievements to celebrate: an affiliation with the Ethnic Cultural Center, the Poly Day event in April. Now, after lobbying by faculty and students, there is an academic victory: a newly announced minor in Oceania and Pacific Islander Studies, beginning in spring quarter. The 25-credit, interdisciplinary program is housed in the Department of American Indian Studies and includes classes from the departments of American Ethnic Studies, Anthropology and English, and the School of Marine and Environmental Affairs. The goal is to offer students a “transformative academic experience” in a coherent, organized curriculum that opens new lines of inquiry into the histories and cultures of a vast yet community-oriented region. “The new minor is exciting for us. It allows the university to join hands with the Pacific Islander community in Washington state by educating about Oceanic knowledge. It also creates visibility for a population that often feels invisible in the larger institution,” said Holly Barker, who helped push for the new program as a lecturer in the Department of Anthropology and curator of Oceanic and Asian Culture at the Burke Museum. The minor, one of nine new UW minors over the past three years, is believed to be the only such program outside the University of Hawaii. City College of San Francisco offers a 17-credit certificate in Critical Pacific Islands Studies, while the University of Utah is currently developing a Pacific Islander Studies initiative. Here at the UW, the name includes “Oceania” – the geographic region that includes Guam, the Marshall Islands and Polynesia, and a nod to the link between the vast ocean and the islands. Housing the program in American Indian Studies reflects that department’s own thinking about identity, said AIS advisor Kai Wise. “A lot of courses study First Nations in Canada, and indigenous peoples in Mexico and Central America. This minor supports the idea that we’re a broader department looking at indigenous studies, not just in the United States,” Wise said. The minor includes a five-credit practicum, designed to give students experience working with the populations they’re studying. Students who pursue this minor, like other majors in its home and related departments, often go into community service or organizing work as a career, Wise said. That’s how Raeleen Camacho, a UW junior, plans to use the minor. A native of Guam, she wants to become a public health nurse and return to work there. Washington has the third largest population of Pacific Islanders in the nation, but the general public is often unaware of issues facing the community, said Taylor Ahana-Jamile, independent learning program manager for UW Study Abroad and a UW alum. What’s more, he said, young Pacific Islanders sometimes have little understanding of their own identities, due to the legacy of colonization. At the UW, Pacific Islander students say they sometimes have felt stereotyped, or generalized as “Asian,” said Kat Punzalan, director of the Pacific Islander Student Commission. The minor can help educate non-Pacific Islanders as well, she said. To the people involved in establishing the new minor, the recognition is similar to that achieved by African-American students in the 1960s, when protests led to the establishment of the Office of Minority Affairs and Diversity, or when later efforts resulted in the creation of departments in American Indian and ethnic studies. All were the work of students who wanted to see their culture, history and identity reflected in the staffing, teaching and outreach of the university. Classes related to Pacific Islander history and culture have been offered for some time, but organizers of the minor such as Rick Bonus, an associate professor of American Ethnic Studies, saw the program as a way to more formally institutionalize the curriculum and validate it as a field of study at the UW. Helen Enguerra, an admissions counselor in the Office of Minority Affairs and Diversity, remembers coming to the UW several years ago as a freshman, eager to find community. Born and raised in American Samoa until she was a teenager, Enguerra said she wasn’t used to the individual nature of the college student experience. But Enguerra took some anthropology classes, joined the Polynesian Student Alliance, and began to see community in new places. “I learned that study groups can be a community. It’s about the Pacific Islander value of reciprocity, how you help one another,” she said. Today, Pacific Islanders make up about 0.5 percent of UW undergraduate enrollment, and reaching out to prospective students is part of Enguerra’s job. Having a designated minor, with so many courses reflecting the interests and learning styles of Pacific Islander students, can help with retention and recruitment, she said. Community is part of that learning style, added Barker, who works with a group of Pacific Islander students from the UW each week at the Burke Museum. She formed the group, known as Research Family, nearly five years ago as a way to help Pacific Islander students feel connected through artifacts, study and friendship. Her anthropology classes features students and people from the community as instructors, as with her special topic during winter quarter, Oceanic Research Methods: The Culture of the Canoe. “There is an Oceanic sense of community building that, when we bring it into the classroom, it is a powerful thing,” she said. For more information on the Oceania and Pacific Islander Studies minor, contact Wise at kaiwise@uw.edu.